During day-1 of the three-week summer program, called Rebirth and Revolution: The Arts in Florence, students settled into their housing, had a morning orientation and began touring the city. 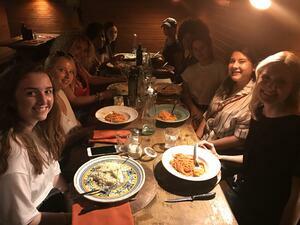 For a welcome lunch, the student group, along with Professor Laurel Lueders, stopped at Borgo Antico. The trattoria, located on the Piazza Santo Spirito in the center of Florence, serves traditional Tuscan cuisine. Later this week, students will visit landmarks such as the Palazzo Vecchio town hall and the historic Santa Maria Novella church.